Calgary, Alberta: November 26th, 2012 -- Mkango Resources Ltd. (TSXV-MKA) (the "Corporation" or "Mkango") is pleased to announce that it has filed a Technical Report (the "Report") for the Songwe rare earth project in Malawi. The Mineral Resource estimates from the Report, as previously announced in the News Release of 10th October 2012, are summarised below and in the tables thereafter. The Report was independently prepared by The MSA Group of South Africa ("MSA") and Dr. Scott Swinden of Swinden Geoscience Consultants Ltd, the "Qualified Person" (QP), who together have currently identifed 1.0% TREO as an appropriate base case cut-off grade for the mineral resource estimate. This will be further investigated on completion of metallurgical test work. 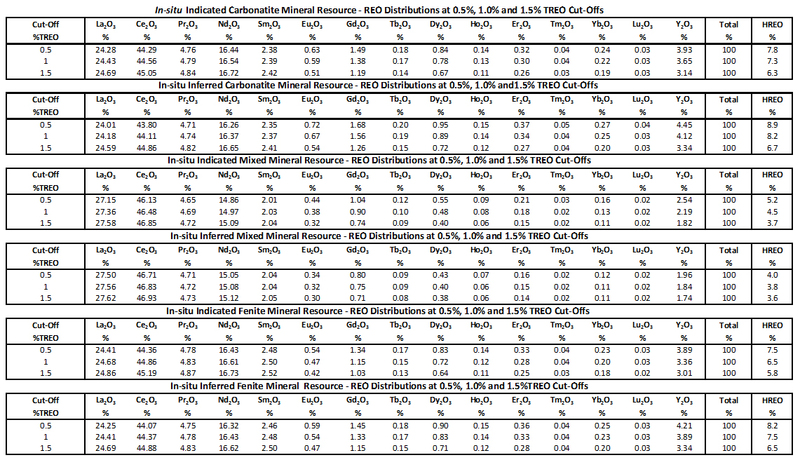 The In-situ mineral resource estimates at different cut-off grades are illustrated in Table 1. The estimated mineral resource has been traced in drill holes to a maximum depth of 350 m below the surface of Songwe Hill and is based on the two phases of diamond drilling completed by Mkango in 2011 and 2012 totalling approximately 6,850 m. The vast majority of the Indicated mineral resource blocks (at a 1% TREO cut-off, 9.1 mt of carbonatite, 0.67 mt of mixed and 1.04 mt of fenite) are at depths of less than 200 m below the surface of the hill. The areas drilled to date are in an elevated position on the northern slopes of Songwe Hill, which rises approximately 230 m above the surrounding plain. The approximate dimensions of the mineral resource estimate are 400 m aligned northeast by 230 m aligned northwest and to a depth of 350 m below and paralleling the topographic surface of the hill and surrounding plain. A schematic geological map illustrating the location of the drill holes will shortly be made available on the Company's website (www.mkango.ca). The individual REO data and ratios as presented in Tables 2, 3, 4 and 5 were derived from length-weighted averages of the drill hole data. Heavy rare earths, as defined here, comprise europium, gadolinium, terbium, dysprosium, holmium, erbium, thulium, ytterbium, lutetium and yttrium. These include the most highly priced of the more commonly traded rare earths, europium, terbium and dysprosium. 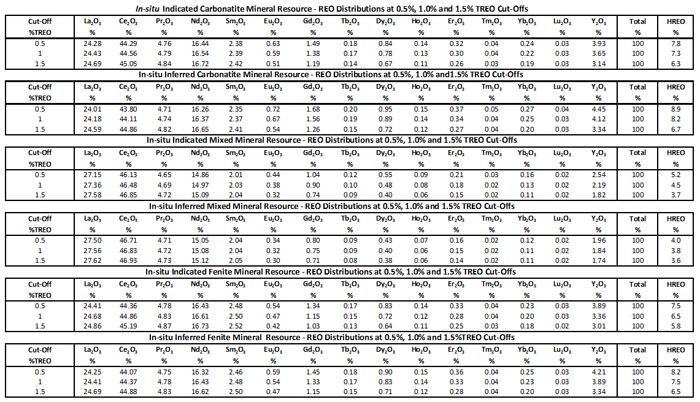 The Songwe Hill mineral resource has an estimated weighted average grade of 2,665 ppm Nd2O3 and 2,240 ppm Nd2O3 in the Indicated and Inferred categories at 1.0% TREO cut-off grade, respectively. This equates to a weighted average proportion of Nd2O3 as a percentage of total rare earth oxides for Indicated and Inferred categories of 16.5% and 16.3%, respectively, as derived from Table 2. Metallurgical scoping work at Mintek in South Africa is ongoing, comprising flotation test work and leach tests. The current flotation test work is focused on a similar reagent regime to that used previously at the Mountain Pass mine and variations thereof. Further reagent regimes and conditions will continue to be tested. Rare earth mineralogy at Songwe is well understood, comprising predominantly synchysite and apatite. mineral resources were classified as either Indicated or Inferred following an assessment of the grade and geological continuity exhibited by the data.